Arguably, there can be no building more famous than the Cape Town City Hall. After all, this is where the father of our free nation, President Nelson Mandela, addressed the country just hours after his release from prison on 11 February 1990. And, it is not just this famous landmark that offers a window into our past in Cape Town. Other buildings include Die Groote Kerk, the SA Jewish Museum, Nazareth House, which still has its original tenant – Sisters of Nazareth, Huis Jannie Marais and Die Ou Hoofgebou on Stellenbosch University’s campus, to name only a few. Painting, waterproofing and construction company, Indawo, has been commissioned to repair and redecorate many of Cape Town’s heritage sites and, according to managing director, Geoffrey Jäck, these buildings demand that extra care when undergoing repairs. “Many still have the original stone walls and intricate roof structures, making it crucial to pay attention to detail,” he says. “Most heritage sites are also well past a century old and restoring them to their original aesthetic appeal can be challenging. In the case of the City Hall, Indawo replaced the roof, with a unique Spanish slate tile, only available through Indawo, and upgraded various roofing elements. This project meant that there had to be a focus on the safety of visitors to the site and passers-by. Removing old roofing material from heights is dangerous and specialised equipment had to be used to bring old material to ground level for disposal. Importantly, Cape Town’s heritage sites play an enormous role in the investment value of the country. Maintenance is vital in ensuring the continuous preservation of infrastructure to drive an upward trend in fixed property values. Tourism plays a big part in the country’s GDP and as such, the buildings that tourists visit must remain in pristine condition. Jäck says that Cape Town’s rich heritage is a pride of the province, as this region has some of the oldest architecture in the country, and it remains a preferred destination, not only for South Africans, but for the international community too. 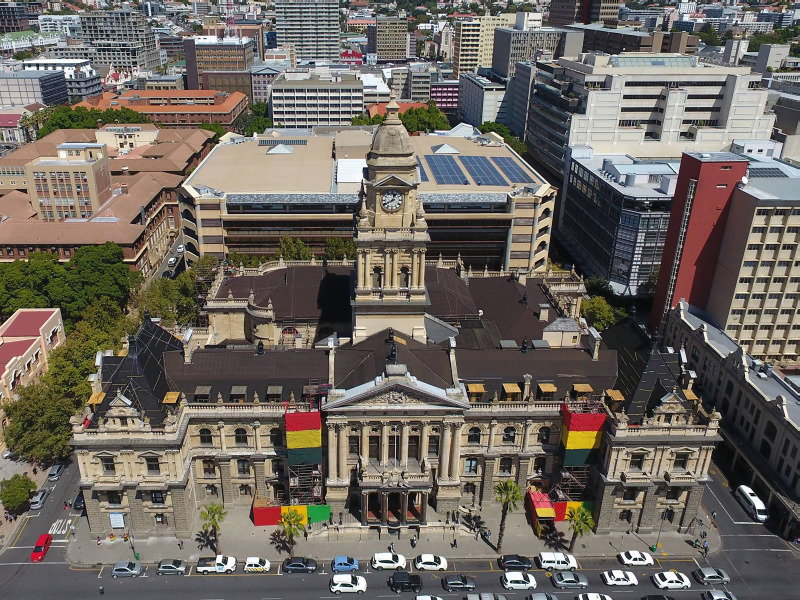 “Maintaining our heritage buildings is a fundamental part of Cape Town’s maintenance strategy and something the city takes seriously. Indawo, as a remedial construction company, is driven by the history that these buildings provide, and the future they still hold in the success of our country,” he concludes. Indawo replaced the roof of City Hall with a unique Spanish slate tile.